Syrian Civil Defense workers search through the rubble in rebel-held eastern Aleppo. BEFORE WAR BROKE out they were bakers, decorators or students. Now Syria’s volunteer rescuers known as the White Helmets risk their lives trying to pull victims from the rubble. Footage of the daring, often heart-rending rescues carried out by the group’s nearly 3,000 volunteers has frequently gone viral, earning it plaudits around the world. Images of the aftermath of bombardments of rebel-held areas almost invariably show White Helmets sprinting into clouds of dust and digging through the debris, often with little more than their bare hands. Among the most famous footage was the July 2014 rescue of Mahmud, a two-month-old dubbed the “miracle baby” after he was pulled from the rubble of a building in battleground second city Aleppo following more than 12 hours of digging. His rescuer Khaled was killed in August in an air strike on the rebel-held east of the city, one of more than 140 White Helmets killed in the war. A painter and decorator, he was an early volunteer for the group, his round face distinguished by his crooked nose and bright eyes. He was just 31 when he died and left behind a wife and two daughters. “If I die saving lives, I think God would definitely consider me a martyr,” he once said. A more recent video showed a volunteer sobbing as he cradled a four-month-old girl he helped rescue in Idlib province. “We’ve been working for two hours to get her out from under the rubble and thank God, it turns out she is alive,” he said, as the girl, covered in dust, coughed and grabbed his collar. It was also seen as a contender for this year’s Nobel Peace Prize, and while it did not win it attracted support from a slew of celebrities. The group was also the subject of a Netflix short documentary. The rescue group emerged in 2013, when the civil war that has now killed more than 300,000 people was nearing its third year. 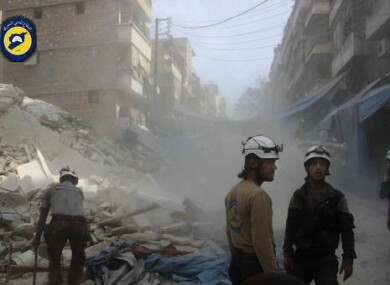 It was not until the following year that it took its current form and began to be known as the “White Helmets” for the distinctive hardhats worn by its volunteers. The group’s motto – “To save one life is to save all of humanity” – is drawn from a verse of the Koran, although the White Helmets insist they treat all victims, regardless of religion. Some of its members have received training abroad, returning home to instruct colleagues on search-and-rescue techniques. It receives funding from a number of governments, including Britain, Denmark, Germany, Japan, the Netherlands and the United States, but also solicits individual donations to purchase equipment, including their signature hardhats, which cost €130. More than five years into the conflict, the organisation now operates some 120 centres in eight provinces in Syria. Its volunteers include 78 women. It operates only in rebel-held areas, saying it is not permitted to work in government-held territory, but insists its volunteers are neutral. “We are independent, neutral and impartial, we are not affiliated to any political or armed group,” White Helmet leader Raed Saleh told AFP last month. Still, the organisation is not without its critics, mostly backers of President Bashar al-Assad’s government. Some accuse it of being a tool of its international donors, governments that largely support the opposition. Others have charged that the group’s volunteers include rebel fighters or even jihadists, circulating pictures purportedly showing White Helmets in civilian clothing bearing arms. But elsewhere, the group’s members have been hailed as “real life heroes” focused only on saving lives. “We stand for the victims and it is our responsibility and our duty to work for the victims,” Saleh said. Email “Syria's heroes: the volunteers who run towards the bombing”. Feedback on “Syria's heroes: the volunteers who run towards the bombing”.